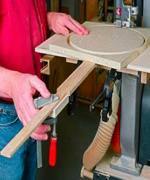 Making perfect circular workpieces is easy with this handy helper. The jig consists of a piece of 1/2 inch plywood with a dovetail slot glued into a centered dado. Into the dovetailed slot slides a matching key with a dowel pivot pin at one end. Wood and/or Supplies needed: We used 1/2 inch thick plywood.